I was shopping for our Memorial Day dinner earlier today and found myself in the produce section of my grocery store hypnotized by the papayas. They looked so delicious…and they were on sale. I never buy papayas, so I wasn’t sure how the family would react to a new fruit, but I couldn’t resist giving it a try. We had fresh and deliciously ripe papaya with dinner, but there was so much left over that I decided to try my hand at making a papaya smoothie. 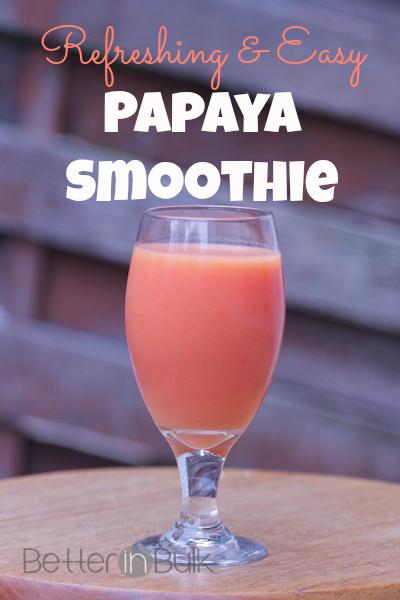 After a little bit of trying this and testing that, I came up with a cool and refreshing papaya smoothie that was satisfyingly sweet but very healthy (bonus!). I froze a bunch of papaya so that I can make this smoothie again anytime. 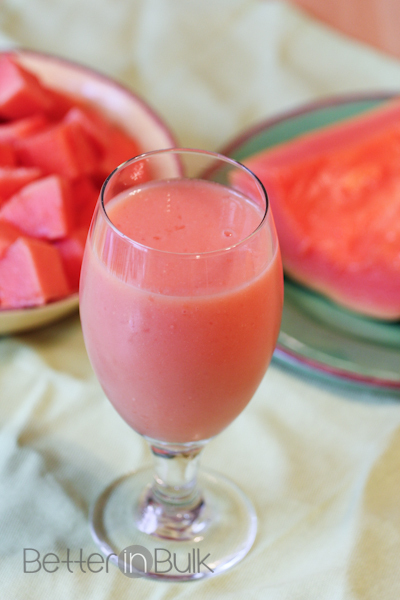 You can freeze your cut-up papaya and blend the frozen fruit pieces for a thicker smoothie. Variations: Add berries or a ripe banana for a different flavor. Experiment with different fruits and amounts until you get it "just right" for your taste! Let me know what variations to this smoothie sound best to you! Papaya is full of antioxidants (Vitamin C, E and beta-carotenes) which help the body fight against cancer-causing calls. Antioxidants also prevent cholesterol from oxidizing, reducing the risk of heart attack or stroke. Papaya is very low in calories but is high in fiber, so it fills you up. Papaya is a great source of proteolytic enzymes which break down the proteins in food, allowing for better digestion. Enzymes found in papaya can help reduce inflammation and improve healing from burns. These anti-inflammatory properties can also help reduce symptoms from asthma and arthritis. Eating papaya can help ease menstrual cramps and promote a regular menstrual flow. It can also ease morning sickness when pregnant. I love papaya, this looks delicious! Thanks for sharing at Merry Monday. Sounds yummy! Never tasted papaya :) I need to try one. It was really tasty and not hard to make at all!